Farm Tomita Here you can find Flower House, Distillery House, Perfume House and more, and walking around the massive farm is very relaxing. One of Japan’s best lavender gardens, this farm is a massive 12 hectares, full of lavender as well as poppies, baby’s breath, ferns, and herbs. You can even buy Farm Tomita’s original lavender perfume, dried lavenders and all kinds of other lavender products. Make sure you try the light purple lavender soft serve ice cream Blue Pond This pond was formed in 1988 when a dam was created to protect citizens from eruptions of the nearby Mt. Tokachidake. The bright blue color, caused by sunlight hitting particles in the water, is creating a uniquely beautiful scene. 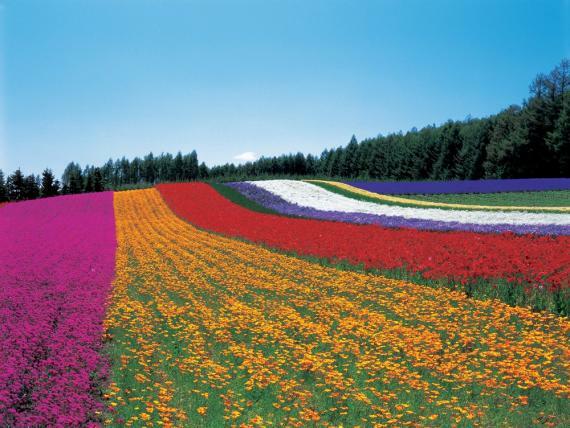 Shikisai no Oka Pretty flowers bloom one after another from May until September. The farmers choice of flowers ensures a long flowering season. Why not come and enjoy the beautiful fragrance of the blossoms amid spectacular panoramic scenery? You also can feed cute alpacas! ... And other places if you still have time. The driver will stop by nice viewpoints for photos as well.